Rookie » Uh, What Should I Wear to Prom? The school-dance canon offers an abundance of practical answers about what to wear to prom or other formal dances: stick to something classic, find a dress that flatters your body, wear pantyhose (hahahaha, jk, nobody says that anymore). But what if you don’t have the money to spend on a dress that you’re only gonna wear once? What’ll you put all your crap in? What if you want to go buck wild and dress in a bonkers theme?! Hello! We (Gabby and Marie, prom experts) are here to help you with those kinds of prom-related queries! We’re going to cover every potential prom-style scenario we can think of—accessories-related quandaries, how to match your look with your date’s or pal’s (if you want to), how to find a prom outfit you can wear again…how to choose your dancing shoes! If you’re going to a formal dance this spring and need sartorial support: Read on. What if I don’t have much money to spend on a dress? Gabby: Some prom dresses are so expensive that I’m shocked they don’t come with a voucher for free party-bus rental and complimentary sparkling apple cider. Formal gowns have some of the worst cost-per-wear ratios! Like, a $60 pair of jeans strikes me as kind of expensive, but then I think about how I’ll wear those jeans at least twice a week for a few years. It’s unlikely that you’ll wear a gown more than once. On the other hand, there is a good chance the pictures taken of you in that prom dress will live on in your parent’s living room (or at least on the internet), so in that sense it’s like you’re wearing it…FOREVER. Most of the looks here won’t set you back more than $100, $200 tops. Vintage and thrifted dresses tend to be even cheaper options, or you could spend zero dollars and borrow a dress from a friend who already did the whole prom thing. Ugh, what is formal attire, even—like, what vibe should I be going for? World-renowned heartthrob, left, with her prom date. I bought my dress at a vintage store in rural Pennsylvania for about $75; the zipper was broken and it needed to be hemmed, so I ended up paying a tailor another $50 to fix those problems. I wore some thrifted earrings and a pair of glittery heels I got at T.J. Maxx for like $17. But dresses are most definitely not the only way to go. You can wear whatever you want! Unlike high school, THERE ARE NO RULES when it comes to your prom ensemble. What if my look is butch or androgynous? Left to right: Leighton Meester, Lea DeLaria, and Samantha Ronson. You could also look for a vintage suit or tux and have it tailored to you (Fourteen has a list of a few LGBTQ-friendly tailors around the U.S.). In terms of accessorizin’, I love these printed bow ties from St. Harridan, and HerTuxedo has cute bow ties and cravats, too (with matching handkerchiefs!). What if I just want to be comfortable? Gabby: Maybe your goal is to wear something that helps you achieve maximum danceability. 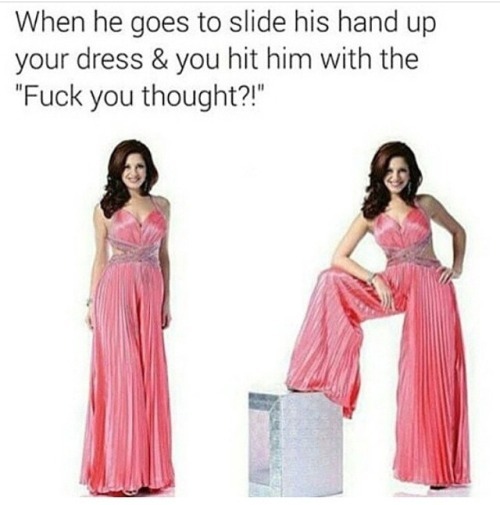 In that case, might I suggest a formal jumpsuit? Left to right: V-neck jumpsuit, $30, Motel Rocks; side-slit jumpsuit, $88, Nasty Gal; one-shoulder jumpsuit, $68, ASOS. These jumpsuits have got all the glamour of a gown, plus the comfiness of pants. If you’re not already sold, just let this girl or this girl convince you. Wait—could I maybe wear my prom outfit again? Left to right: Quilted bralet, $28.50, and pleated metallic skirt, $69, ASOS; skirt set, $45, Pixie Market; flower-print bralet, $40, pants, $63, and blazer, $109, ASOS. These sets are from ASOS and Pixie Market, but Missguided and Topshop also have tons. i hope Rookie puts together a gallery of everyone’s prom looks, i wanna see all of your outfits!! Yaasssss. There is never a bad time to make an HSM reference. Gabby you look fabulous! *-* I’m in looove with your outfits! Also, this was so helpful! It’s my prom soon and I’m sooo exited. Ugh, this is making me regret buying a plain-jane floor length dress instead of a beautiful vintage 50s one like Gabby or Marie (both of you look flawless, btw). I guess I’ve gotta find funky accessories now! Anyone got ideas on where to get a nice antique-y/vintage brooch (in Canada)? The Year 10 formal is all anyone’s really been talking about at my school, and it’s still ages away. I just don’t know what I want to wear or do and I got nothing yet. Maybe it’s time to acknowledge that formal is happening and I need to be prepared. thanks for the advice here. PLS LETS MAKE FORMAL BACKPACKS A THING! Gabby you look amazing and also your prom date does! I’ve never seen a guy dressed so well for prom! Usually it’s ill fitting tuxedos with plain solid bow ties… His suit just fits him really well and I’m jealous okay! Such a cute, yet helpful post!